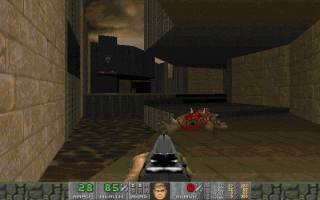 "DANTE'S GATE" is the first in a series of levels for Doom 2. The series is called INFERNO, and that's the theme of this level. Right from the start I was impressed by the stylish looks; the brick and metal main textures are mixed well with decorative textures and lighting to create a good level. The only disappointment was the large outdoor area, which had some blocks suspended in the air, and rather blockish pillars and walkways. The action is good too, with good use of monsters; traps usually had a mixture of enemies, which needs more thought to play. There are quite a few traps and secrets, though there were less effective than they could have been, as some showed up on the map. But do save regularly, there are some crushing ceilings used in awkward places. Overall, definitely a good level to play. There were just a few minor things that meant I didn't give it a top rate, but otherwise it's very good. dante25.zip, size 98kb, date 1996/3/30. DANTE25.BAT, size 0kb, date 1996/3/11. DANTE25.LMP, size 127kb, date 1996/3/23. DANTE25.TXT, size 7kb, date 1996/3/23. DANTE25.WAD, size 183kb, date 1996/3/11.